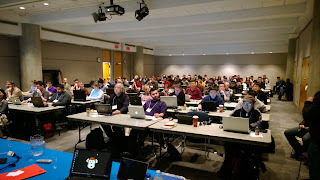 UI Geek's Blog: DVLUP DAY was awesome! Nokia's DVLUP Day in Vancouver on December 7, 2013 was kind of like an out of body experience for me. It's not often you get a chance to commune with so many enthusiastic developers that are working and learning on a topic that you enjoy so much. Nokia went all out with this event. Providing Nokia top of the line backpacks and a whole bunch of goodies to every attendee as well as bringing in top notch presenters. On top of that Nokia has pledged that every attendee that creates and publishes a Windows Phone app (or updates an existing one) within two weeks of the event will get a brand spankin' new Nokia Lumia 620 device for their very own. Should make App development go even faster!. While I was there representing the Vancouver Windows Phone Developer Group (www.wpdg.ca) and at various times offering help to some of the developers, I also absorbed so much from the really great suite of presenters available. It is rare that such a collection of speakers on such a narrow topic all get together in one place. Usually with such a high profile group of speakers, you would expect it to be something like Microsoft's Tech Ed or Build conference with lots of different topics. But no, this was all about Windows Phone. 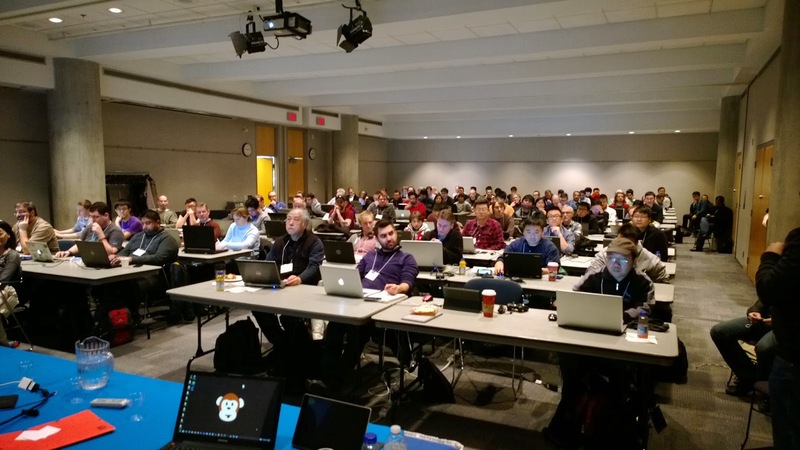 Many in attendance had never written a line of code for Windows Phone before, but there they were by about 3 in the afternoon, loading up Visual Studio or App Studio and beginning to create. And create they did. I, personally, got to see many great ideas come to life. Often they didn't have a phone or even an emulator to test on, so the folks that had phones were allowing them to test and view on our phones. What great fun to see such interesting ideas and in many cases really beautiful apps flourish in the crucible of development that was DVLUP DAY. Astonishingly many developed with no way to see their results but in the Visual Studio window. How easy is that? Windows Phone Development Rocks! We started off with Jan Hannemann (@Bitdisaster) introducing the cast of characters. Jan is a Nokia Developer Ambassador that has assisted many local (and not so local) developers discover the fun (and sometimes addictive habit) of creating Windows Phone Apps. There were more than a few people in that room that had Windows Phones given to them by Jan over the past dozen or more months. Jan is no slouch in coding either with Apps in the store that are rising stars. First up was Nick Landry (@activenick). Nick got everybody revved up over the tools and methods out there for creating apps. He really got their attention with App Studio, a tool that could get them started without actually having to write any code. Nick had them really soaking up the different options for getting started. Nick's sense of humor and vast experiences he shared with the crowd had them laughing and in many cases starting to formulate their ideas for their own apps. I'm pretty sure by the time Nick was done, there were some people that already had their apps in development. The room was a great layout with table space for 100 developers (although there were probably another twenty working in overflow on their laps) with their development machines all setup and ready to go. Now that the attendees were all worked up and ready to go, in comes Atley Hunter (@atleyhunter), probably the single most prolific App writer on the planet, no matter the platform. He has almost 300 apps (we know about) in the Windows Phone Store alone. Atley was able to bring his proven experience with success in the Windows Phone Store and share that with everybody in attendance. He shared tricks for increasing downloads, monetizing apps and many other little things that add up to big success. Personally, the #1 thing I get from Atley is communicate, communicate, communicate. Nobody knows what they want in your apps more than the people using them. Know what they want and you can't help but win! Atley had them on the edge of their seats his entire presentation (which had almost no slides as he hates doing slide shows). What a great way to go into lunch. Both Atley and Nick are Nokia Developer Ambassadors also, along with Microsoft MVPs for Windows Phone. There are very few Windows Phone MVPs so it was great having two of them there at the same time. The event was scheduled to run from 8 in the morning until 9 at night so breakfast, lunch, dinner and snacks were provided. BCIT downtown were very hospitable to us and we were very thankful. After lunch it was time for the speakers with hair. First up was Thomas Lewis (@TommyLee), a Microsoft Technical Evangelist who told us all about game development with HTML5 and JScript. Some really cool new tools from Microsoft to make it easy to create games for Windows Phone and Windows 8.1. Folks at DVLUP DAY were among the first to get their hands on this new tech. No post lunch sleepers in this room! Our last speaker of the day had special interest for many in attendance. Jordan Karlik, the creator of the hugely popular game, Fling Theory, presented porting Unity games to Windows Phone 8. He spent some time showing the basics of what Unity could do for you in game development. When his talk was over, we actually had to move him to a break-out room for him to continue with the game developers present a more in depth discussion. Then it was time to HACK! The results still remain to be seen but out of that room of 120 attendees there were LOTS of people with Apps completed or nearing completion. We look forward to the results and Nokia, I'm sure, is looking forward to giving away LOTS and LOTS of phones!